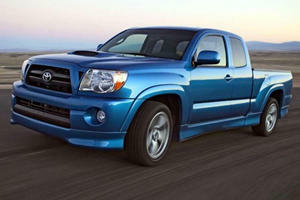 It’s really, really tough for me to be unbiased when it comes to the Toyota Tacoma. In high school I was obsessed with the Tacoma, specifically the four-door TRD model. I thought it looked so damn cool, especially compared to my beat-to-hell Ford Ranger standard cab. So when I took the keys to a 2016 Tacoma Off-Road Double Cab my high school self instantly resurfaced. However, this presented a unique problem when it comes to reviewing a pickup. Namely, high school me didn’t do much truck stuff. Yes, I drove a Ranger but I didn’t spend my weekends filling the bed with rocks or hauling a trailer full of tools to and from construction sites. Of course I used the bed, but mostly to help friends move or to store anything that wouldn’t fit in the cab (which was just about everything). And even though I dreamed of owning a Tacoma TRD Double Cab I probably wouldn’t have done anything differently, except for fitting more people and stuff inside it while feeling infinitely cooler. Flash forward ten years and adult me was finally behind the wheel of a Tacoma with no “truck stuff” to do. But before you kill me just know that I tried to go off-road. Toyota’s new ad campaign for the 2016 Taco practically begs you to do so. But unfortunately we were only allowed to drive on dirt or gravel roads, and our off-roading location of choice is short on straight lines and long on hills. I didn’t think that would give us a full understanding of the Tacoma’s Crawl Control or its Multi-Terrain Select (MTS) system. Crawl Control is the equivalent of off-road cruise control. When engaged, say in deep sand or mud, the vehicle’s computers and sensors work together to drag you out of the muck. The truck drives itself, meaning all you need to do is steer. MTS offers three off-road driving settings, loose rock, mud and sand. When engaged, the throttle and brake pressure are adjusted accordingly to suit each type of terrain...except for pavement. While I didn’t get to engage 4WD I did do some light "truck stuff." I put a few things in the bed, although that amounted to a bicycle and maybe 20 pounds of junk destined for the dumpster. Needless to say I came in way under the truck’s stated payload capacity of 1,175 pounds. And while my Tacoma was equipped with the $650 V6 Tow Package (a class IV towing receiver hitch, ATF cooler, engine oil cooler, power steering cooler, 130-amp alternator, 4 & 7 pin connector with convertor and Trailer Sway Control) you probably guessed that I didn’t tow a damn thing during my week with the Tacoma. So just what the hell did I do with the truck? Well, I drove it and lived out my teenage dream. 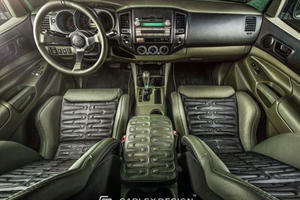 The Taco’s 3.5-liter V6 engine makes 278 hp and 265 lb-ft of torque. The transmission is a six-speed automatic. The Tacoma in its TRD Off-Road and Double Cab guise weighs in at 4,425 pounds and isn’t even close to quick, as you’d expect. But there was some nice passing power at highway speeds. Despite measuring 212.3 inches, or 17.6 feet—the bed came in at 5 feet—the off-road warrior was a delight to drive in the city. While parking could certainly be a pain—the rear backup camera (standard) and rear parking sonar and cross traffic alert (part of the $2,330 Premium & Technology Package) made life much easier. While I didn’t get to test out the off-road suspension and Bilstein shocks properly I can say that they made potholes and crappy pavement feel like buttery smooth surfaces. The Tacoma wasn’t exactly fun to drive through the claustrophobic streets of San Francisco but at no time did I ever feel too big to belong. 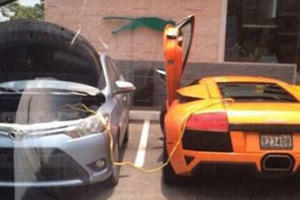 Its MPG split is 18/23/20. In the city I averaged almost 16 mpg and on the highway I was once told that I touched 30 mpg, but that was a momentary—if exciting—anomaly. Inside there is seating for five, although at 6’1”I found the back a bit cramped, especially behind the driver’s seat. But my seat was leaned back in a sort of “cruising” position. Overall the cabin is above average but nothing special. I think the center console has a better layout than the Chevrolet Colorado/GMC Canyon and I especially enjoyed the paint-matching metal accents that ringed the 7-inch touchscreen and A/C vents. The fabric seats didn’t really blow my mind and I was a bit shocked to find that the front seats didn’t have power controls, although they were heated. My tester did include a wireless smartphone charging pad and moonroof, but for $37,610 I would have liked to see some power seats! While I was a bit bummed with the interior I found the exterior styling to be excellent. Toyota said the TRD Off-Road’s design was inspired by desert racing, with Bill Fay, Toyota division group vice president, saying it was “built for lifestyles of the young and young-at-heart." That’s a pretty cheesy line but I do agree that the Tacoma looks modern compared to its competitors. The front end is slim and the hood stands high, with the 32-degree approach angle making the Tacoma look more like a trophy truck and less like four-wheeled box with a bed. But perhaps the biggest change in design is the massive new grille, which replaces the barely there grille on the 2015 model. The off-road design is further complemented by 16-inch machined contrast alloy wheels and Goodyear Kevlar-reinforced off-road tires. Other than that the cab is boxy as expected and the rear is nothing too exciting, save for all the all-new lockable tailgate, a Tacoma first (seriously). Teenage me would have been happy enough filling a badass-looking truck with his friends and maybe a cooler and some beach gear in the bed. But time changes your expectations for a car. I thoroughly enjoyed driving the Tacoma for a week but I experienced it more as a car than a truck. What I didn't understand all those years ago was that capabilities matter more than coolness, especially when the price of an image is a cool $37k. 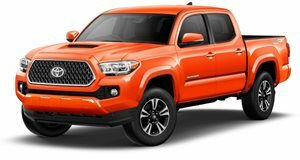 The Tacoma is damn cool, but I don't know whether it's capable enough to justify its price tag. Hopefully a follow-up review will fix that.